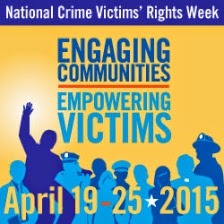 Every year at this time, the U.S. observes National Crime Victims’ Rights week—promoting victims’ rights and honoring crime victims and those who advocate on their behalf. Millions of Americans each year are victimized by crime—acts of terrorism, violent crime, human trafficking, hate crimes, financial fraud, child abuse, cyber crime, kidnapping, bank robbery...the list goes on. And the FBI’s Office for Victim Assistance (OVA) is responsible for ensuring that victims of crimes investigated by the Bureau are afforded the opportunity to receive the services and notifications they are entitled to and the assistance they need to cope. The OVA manages the day-to-day operational aspects of our victim assistance program in each of our 56 field offices, where our victim specialists work with those who have suffered physical, emotional, and/or financial harm as a result of a federal crime. In addition, OVA is also responsible for providing training and information that equips FBI agents and other Bureau personnel to work effectively with victims. Individuals impacted by crime face the daunting task of rebuilding and healing from loss while navigating the criminal justice system—treating them with fairness and respect greatly benefits these victims and allows us to build better cases.